I’ve always felt fortunate that residents of Western Washington need not worry about encountering a deadly snake while hiking in our home territory. The same goes for divers and sea snakes — which are even more venomous than terrestrial snakes. The cold waters of Washington and Oregon tend to keep the sea snakes away. The same used to be said for California, where sea snake sightings were once extremely rare. That has been changing, however, the past few years — especially during years when higher ocean temperatures encourage tropical creatures to make their way north. Is it just a matter of time before Washington scuba divers begin to report the presence of sea snakes? 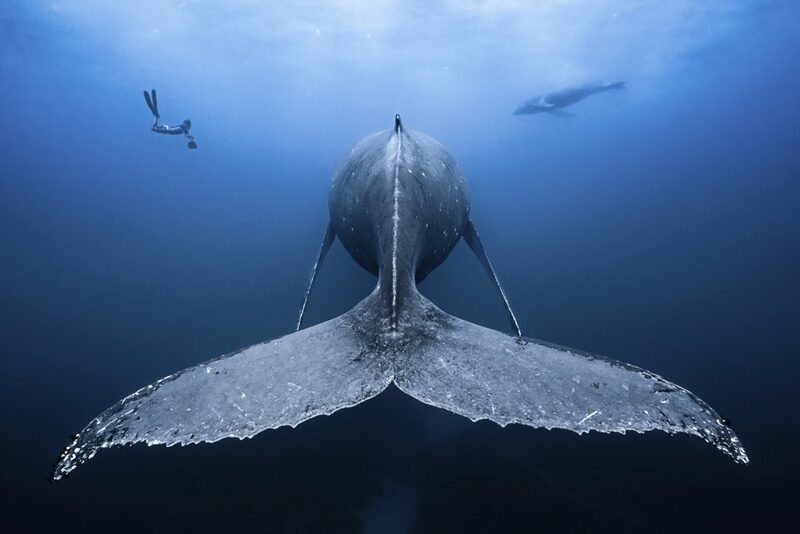 More than 5,000 underwater photographs, taken by photographers from 65 countries, were submitted for judging in the annual Underwater Photographer of the Year competition. The contest, based in Great Britain, was started in 1965 and celebrates the art and technology of capturing images under water — from the depths of the ocean to “split shots” at the surface, from open waters to enclosed estuaries, from lakes to even swimming pools. I first reported on this contest in Watching Our Water Ways last year and received such a positive response from readers that I decided to make it an annual feature of this blog. The 125 winning entries are shown in an online Gallery of the 2019 winners. A series of videos provides insight from the photographers telling the stories that surround their winning entries. I’m hoping you will enjoy another dose of kids’ art, this time related to endangered species. An art contest was recently completed in concert with the 13th annual Endangered Species Day, which was this past Friday. “Hawksbill Sea Turtle” by grand prize winner Brandon Xie, a fourth-grader in Lexington, Mass. 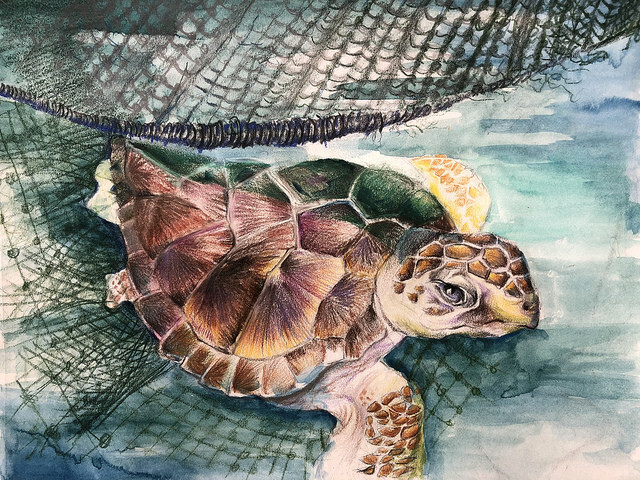 More than 1,500 students from around the United States entered this year’s “Saving Endangered Species Youth Art Contest,” according to organizers. The goal of the contest is to encourage public appreciation for imperiled wildlife and to increase support for saving endangered species. “The artwork created by this generation of young people is clearly demonstrating how they think deeply about the plight of endangered species,” said Leda Huta, executive director of the Endangered Species Coalition, which sponsors the contest. “It is clear that they recognize not just our role in impacting wildlife and plants, but also our opportunities to bring them back from the brink of extinction. Each work of art is an inspiration to all of us to do more, to save more,” she said in a statement. Contractors are putting the final touches on two new bridges in Kitsap County, both of which are expected to improve the local environment. 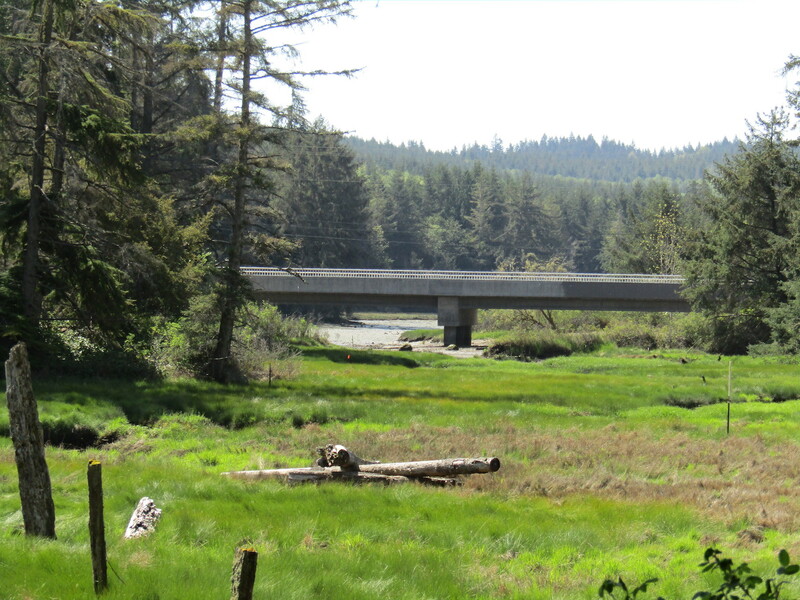 A new bridge over the Carpenter Creek Estuary near Kingston helps to restore the upper salt marsh. One is a 150-foot bridge that crosses the Carpenter Creek Estuary on West Kingston Road near Kingston. The other is a 50-foot bridge that crosses Big Anderson Creek on Seabeck-Holly Road near Holly. Among local residents, the Carpenter Creek bridge may best be known as the bridge that blocked traffic and forced a detour near Kingston for more than a year — much longer than originally planned. (Recall reporter Nathan Pilling’s story in the Kitsap Sun.) While contract issues remain in dispute, the environmental benefits are clear, according to Joleen Palmer of the nearby Stillwaters Environmental Center. Pesticides and salmon: Can we see a light at the end of the tunnel? Once again, the National Marine Fisheries Service has determined in official findings that three common pesticides — chlorpyrifos, diazinon and malathion — raise the risk of extinction for threatened and endangered salmon. 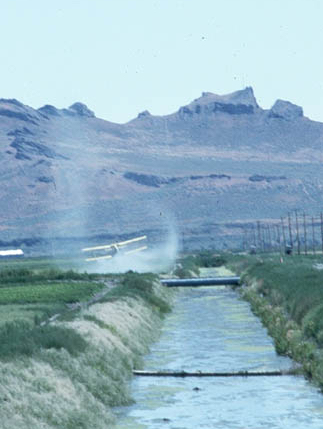 A crop duster sprays pesticide on a field near an irrigation ditch. By extension, for the first time, the agency also concluded that those same pesticides threaten Puget Sound’s endangered orca population by putting their prey — chinook and other salmon — at risk. This politically and legally charged issue — which has been around for more than 15 years — has gone beyond a debate over potential harm from pesticides. It also raises uncomfortable questions about whether our society will follow science as we try to solve environmental problems. The immediate finding of “jeopardy” — meaning that the three pesticides pose a risk of extinction — comes in a biological opinion (PDF 415.6 mb) that is more than 3,700 pages long and covers not just salmon but, for the first time, dozens of other marine species on the Endangered Species List. The report follows a scientific methodology for assessing the effects of pesticides that arises from suggestions by the National Academy of Sciences. The NAS report (PDF 14.2 mb) attempted to reconcile differing methods of assessing risk that had been used by the Environmental Protection Agency, the U.S. Fish and Wildlife Service and NMFS. EPA’s original assessment raised no concerns about the effect of these pesticides on the survival of salmon populations. The original lawsuit by environmental groups forced the EPA to “consult” with NMFS, as required by the Endangered Species Act. The result was the first jeopardy finding in 2008. For background, see Water Ways, Aug. 11, 2008, in which I reported that the long wait for regulatory action on pesticides may be about over. Little did I know. The biological opinion, or BiOp for short, examines both the direct harms to species exposed to pesticides — such as effects on behavior, reproduction and immune function — as well as indirect effects — such as whether the pesticides wipe out insects needed for the fish to eat. The new BiOp is considered a pilot study for future pesticide assessments. The next step is for the EPA to restrict the use of the pesticides to reduce the risks for salmon and other species. Among suggested measures, the BiOp says those who use pesticides must limit the total amount of chemicals applied in high-risk areas, such as streams. No-spray buffers or similar alternatives are suggested. Interim no-spray buffers, established by the courts, will remain in effect until the EPA takes action. The interim buffers were put on, taken off, and are back on as a result of the lengthy court battle between the agencies and environmental groups. Pesticide manufacturers have weighed in, arguing about the need for pesticides without undue restrictions. The Trump administration asked the court for a two-year delay in the release of the BiOp, but NMFS ultimately met the deadline when the judge failed to rule on the request in time to make a difference. I discussed some of the ongoing intrigue and a bit of history in a Water Ways post last August, after EPA Administrator Scott Pruitt reversed course on an impending ban on chlorpyrifos. The proposed ban, approved during the Obama administration, came in response to studies that showed how the chemical could adversely affect children’s brains. Although it took legal action to get to this point, agency and independent scientists have worked together to study the problem and come up with solutions. The question now is whether policymakers and politicians will take reasonable steps to reduce the risks based upon these findings, which are complex, evolving and rarely definitive for all time. As I was going back through the blog posts I’ve written about pesticides, I recalled that President George W. Bush wanted to limit scientific consultations in an effort to streamline the regulatory process — much as President Trump’s people are doing today. Check out Water Ways from March 4, 2009, which shows a video of President Obama reversing the Bush policy and speaking out for increased input from scientists. When it comes to human health and the environment, it is good to remember that without the work of scientists, many species throughout the world would have been wiped out long ago. Human cancer, disease and brain impairment would be far worse today without regulations based on scientific findings. Science can tell us about the risk of pesticides and other threats to salmon and orcas. But knowledge is not enough. People must take reasonable actions to protect themselves and the environment. And so the story goes on. Last week, Earthjustice, which represents environmental groups in the legal battle, released the biological opinion, which had been sent by NOAA as part of the legal case. The group posted links to the document and related information in a news release. As far as I know, nobody in the Trump administration has spoken about the findings. They’re called the Gator Girls, because of their personal and affectionate connections to alligators — which we all know can be dangerous to people who get in their way. I don’t believe the three Gator Girls featured this week in “Water Ways” know each other, but all have become fairly well known on the Internet for their videos and Instagram pages. Gabby Scampone, 22, started out as a pet sitter with an affinity for snakes and reptiles. Since then, Gabby has moved from Westchester, N.Y., where she attended college and started her business, to Fort Lauderdale, Fla., where she now “wrestles” alligators as a volunteer at Everglades Holiday Park. She also works for the associated Gator Boys Alligator Rescue, where she helps remove nuisance alligators from people’s backyards. Check out reporter Kelly McLaughlin’s follow-up story at Daily Mail Online. Gabby says she is living her dream, as she chronicles her story on Instagram, where she has about 7,600 followers with more joining every day since the latest story came out. Her goal is to keep all her fingers as she continues handling the sharp-toothed gators up close and personal. I can understand the apprehension of some of her followers. “This is not going to end well,” writes one commenter on the Daily Mail story. Florida residents with gator problems apparently have been reaching out to Gabby and her rescue team to safely remove large reptiles from their yards. “Unfortunatelly, that isn’t how it works,” she writes on her Instagram page. “You cannot call me or Paul personally, or even the rescue. By law, I cannot legally touch an alligator I do not have a permit for. If you have a nuisance alligator, you have to call the Nuisance Alligator Hotline, and they will issue a permit to a trapper in your area. “Unfortunately,” she continues, “you cannot request specific trappers, and 95% of the time other trappers will kill the alligator. (The trapper sells the alligator for its meat and hide; you don’t get paid otherwise.) The best thing to do is to educate yourself and learn how to co-exist with these animals. Never feed a wild alligator; don’t let your pets (or friends, children, yourself) swim in the water; and put up vertical fences. An even younger Gator Girl is Samantha Young, featured in a video wrestling alligators at 9 years old at the family-owned Colorado Gators Reptile Park. Her parents, Jay and Erin Young, thought it would be safer for her to live on the alligator farm if she knew how to handle the animals. Samantha is older now, as shown in later photos for a story in The Daily Mail, which seems to like alligator stories. Gator Girl Angela Lance of Pennsylvania is in a class by herself with a pet alligator named LillyGator. Angela dresses her pet in colorful outfits, paints her nails and kind of snuggles with her pet as she gives massages. Angela says this may be the most pampered gator in the world. Angela’s life with alligators began about six years ago, when she rescued an alligator being kept in poor conditions. She nursed the animal back to health and eventually turned it over to a sanctuary. But she couldn’t resist getting another alligator, so she bought Lilly as a 2-day-old hatchling about five years ago and has raised her since, according to an online article in People magazine. As I was writing this blog post, I kept thinking of a cartoon from my childhood, “Wally Gator,” shown in the video below. Stories about this crazy alligator, created for Hannah-Barbera Productions, ran for the first time from Sept. 3, 1962, to Aug. 30, 1963, according to Wikipedia. Although his theme song calls him a “swingin’ alligator of the swamp,” Wally actually lives in a zoo, where the zookeeper, Mr. Twiddle, tries to keep him contained. Wally keeps wandering away from the zoo and getting into trouble, but he always comes back. For other alligator facts, jokes and oddities, check out my Water Ways entry from Feb. 29, 2016. More than 25,000 photographs taken throughout the world were submitted for judging in this year’s prestigious National Wildlife Photo Contest. 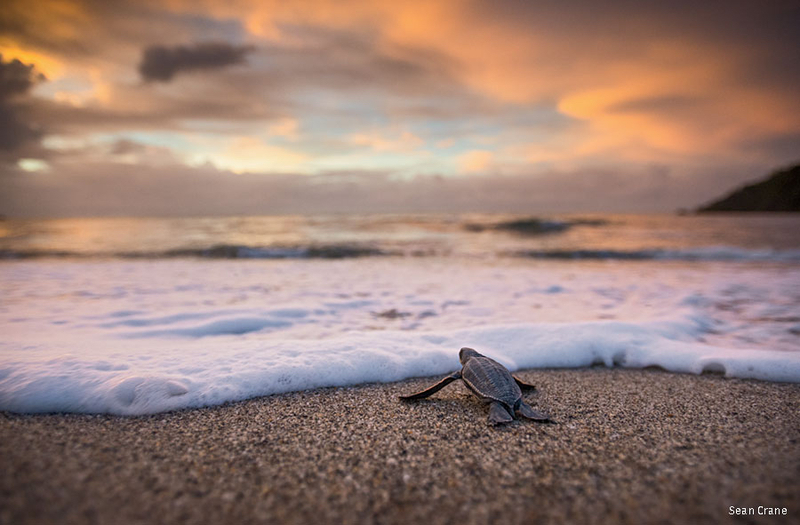 Second-place in category Baby Animals: This leatherback sea turtle was seen at Sunset in Trinidad. Photographer: Sean Crane, Scarsdale, N.Y. Subjects ranged from an elephant trudging across a barren plain to a green sweat bee perched on a blue flower. Without exception, the winning images were stunning, to say the least. The annual contest is sponsored by the National Wildlife Federation and “National Wildlife” magazine. First- and second-place winners were named in seven categories: Baby Animals, Backyard Habitats, Birds, Landscapes and Plants, Mammals, Other Wildlife and People in Nature. In addition, a grand-prize winner was selected from among all the best entries. Images on this page can be enlarged by clicking on the photo. 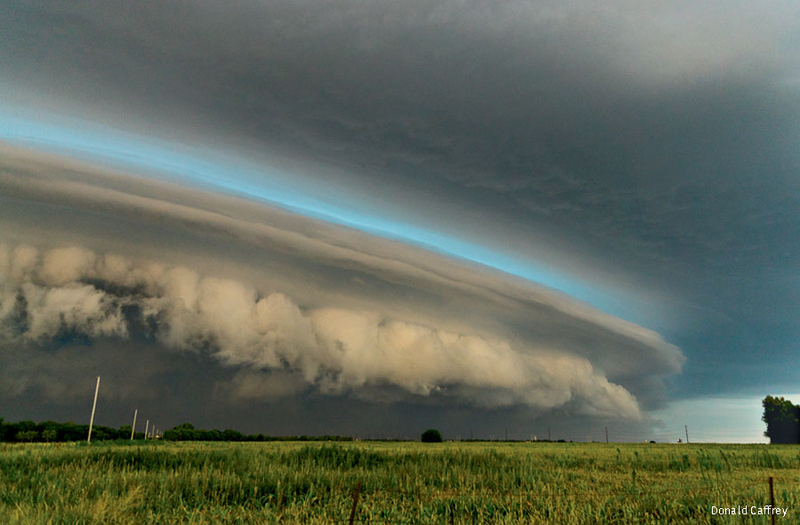 First place in category Landscapes and Plants: Thunderstorms billow across a Kansas plain. Photographer: Donald Caffrey, Goddard, Kans. 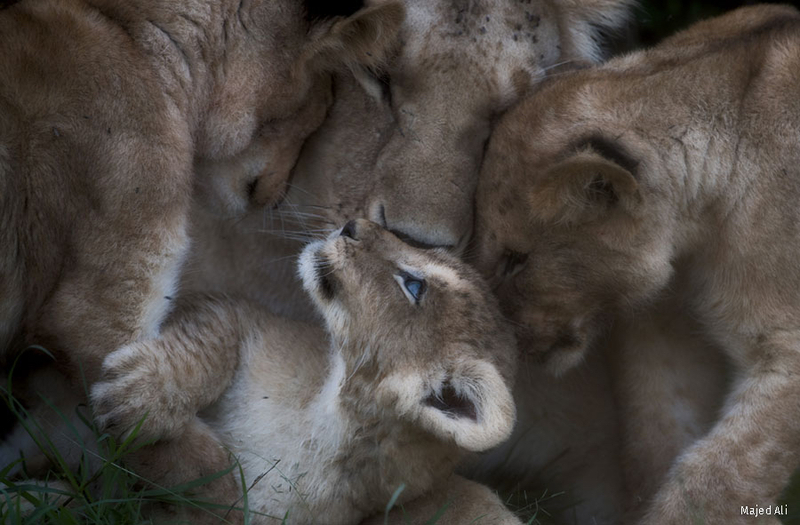 First place in category Mammals: A mother lion rests nose-to-nose with her young offspring in Kenya. Photographer: Majed Ali, Kuwait City, Kuwait. Next year’s contest will be open for submissions on Jan. 8. For details, check out the photo contest page of NWF. Bright lights that affect the behavior of birds, fish and other wildlife are emerging as a significant environmental concern. Yesterday, for example, two environmental groups filed a lawsuit against the Hawai’i Department of Transportation for bright lights the agency controls at piers and airports. The groups say three species of seabirds on the Endangered Species List have been circling the lights until the birds drop from exhaustion, and some birds have died. Meanwhile, in Lake Washington and the nearby Cedar River in King County, there is evidence that threatened chinook salmon are at greater risk from predators because of lights on the two floating bridges as well as industrial facilities in Renton. In Florida, researchers have discovered that female turtles avoid coming ashore to lay their eggs where bright lights are present, and in Virginia salamanders have delayed their feeding efforts in the glare of lights. The lawsuit in Hawaii was filed by lawyers for Earthjustice out of concern for three species of seabirds: Newell’s shearwater, a threatened species, and Hawaiian petrels and band-rumped storm petrels, both endangered species. The Hawai’I Department of Transportation has failed to protect the birds, as required by the Endangered Species Act, according to the lawsuit filed on behalf of the Hui Ho‘omalu i Ka ‘Āina, Conservation Council and the Center for Biodiversity. Because the lighting is injuring and killing listed species, the state agency must obtain an incidental take permit and initiate actions to minimize harm, the lawsuit says. For details, see the complaint for declaratory and injunctive relief (PDF 1.4 mb). Lights at airports and harbor facilities have been documented as the greatest source of injury and death to the seabirds, which migrate at night and become disoriented by the artificial lights, the complaint asserts. Some birds crash into buildings, while others end up on the ground where they may be struck by vehicles or eaten by predators. 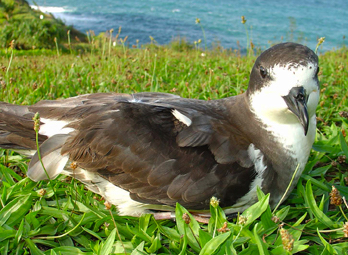 Since the 1990s, the Newell’s shearwaters have declined by 94 percent and the Hawaiian petrels on the island of Kauai have dropped by 78 percent. “Our ancestors depended on the ‘a‘o (Newell’s shearwater), ‘ua‘u (Hawaiian petrel) and ‘akē‘akē (band-rumped storm-petrel) to help locate schools of fish, to navigate from island to island and to know when the weather is changing,” Kauai fisherman Jeff Chandler was quoted as saying in a news release from Earthjustice. According to the news release, the Department of Transportation dropped out of talks with state and federal wildlife agencies that are developing a habitat conservation plan to protect the seabirds. After Earthjustice filed a notice of intent to sue, the agency rejoined the talks. As for the lights on and around Lake Washington, I have not heard of any proposed lawsuits to protect the threatened Puget Sound chinook, but concerns continue to simmer. Jason Mulvihill-Kuntz, salmon recovery manager for the Lake Washington/Cedar/Sammamish Watershed, told me that the next regional chapter of the chinook recovery plan will call for further study into the effects of lights on juvenile chinook migrating down the Cedar River and through Lake Washington. Lights on Lake Washington may be creating a double whammy for young chinook, Jason said. 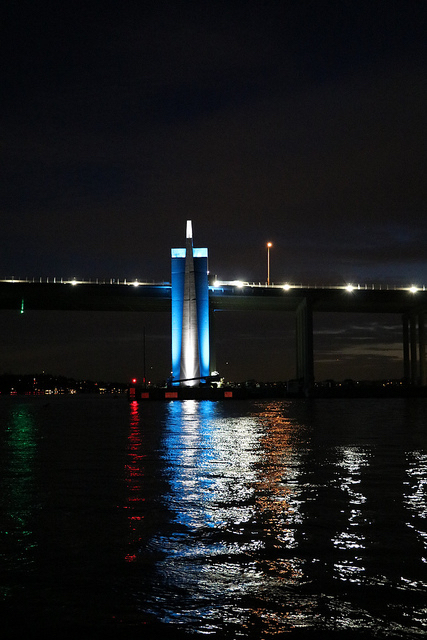 First, the lights attract the fish, which slow down their migration to Puget Sound. Second, the lights keep them visible to predators at night, so the fish may be eaten 24 hours a day. Nonnative predatory fish include bass, walleye and northern pike. Native predators include cutthroat trout and pike minnow. Predatory birds include the western grebe and great blue heron. An updated chinook recovery plan for the Lake Washington region is under review and could be finalized this fall. Predation is getting some additional attention this time around, Jason said, and the issue of lights is something that needs more study. Experts at the U.S. Fish and Wildlife Service have identified potential concerns with lighting along Lake Washington in a series of studies going back more than 10 years. It still isn’t clear, however, how much the known problems with predators are exacerbated by bright lights. That’s why more studies are needed. Following complaints from residents of Laurelhurst near the Highway 520 bridge, the Washington Department of Transportation reduced the amount of illumination coming off that bridge, and further investigation is underway. Check out the King-5 News report below. With regard to other species, lights are known to have a variety of effects. Reporter Sharon Guynup outlined the problems for birds, turtles, amphibians, mammals and even insects in a revealing story in National Geographic News, April 17, 2003. A group of British researchers from the University of Exeter compiled a list of the known effects of light on various species while considering the role of artificial lighting. See “The ecological impacts of nighttime light pollution; a mechanistic appraisal” in Biological Reviews. Hood Canal and its surrounding watershed have been nominated as a Sentinel Landscape, an exclusive designation that recognizes both the natural resource values and the national defense mission of special areas across the country. 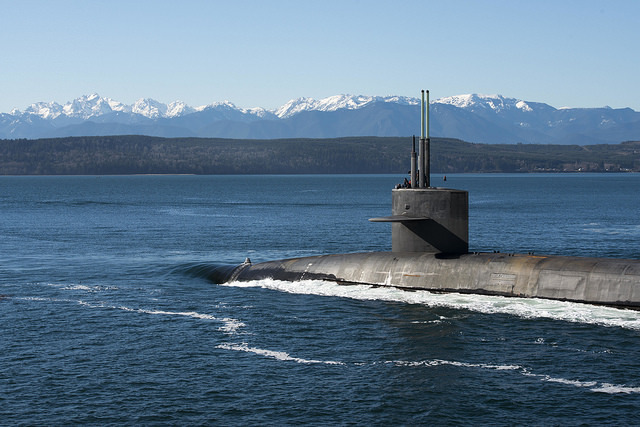 USS Henry M. Jackson, a Trident submarine, moves through Hood Canal in February on a return trip to Naval Base Kitsap – Bangor. If the designation is approved, it will bolster applications for federal funding to protect and restore important habitats and to maintain working forests in and around Hood Canal. Given the uncertain budget for environmental programs under the Trump administration, it wouldn’t hurt to have the Department of Defense supporting the protection of Hood Canal. The Sentinel Landscapes Partnership involves the U.S. departments of Agriculture, Defense and Interior. The idea is to coordinate the efforts of all three agencies in locations where their priorities overlap, according to the 2016 Report on Sentinel Landscapes (PDF 5.6 mb). I don’t believe I’ve ever written about alligators, probably because they don’t live in the Northwest, and it’s not easy to find their amusing side. But American alligators are interesting, once you get to know them. I’ve never noticed that alligators have two kinds of walks while traveling on land. Their ankles flex in a different way than most reptiles. There is a “high walk,” in which the alligator pushes itself up from the ground and moves quickly. This walk resembles that of four-legged mammals. They also do the “low walk,” a sprawling locomotion in which their belly slides along the ground, though somewhat different from a salamander or lizard. Although they normally move slowly, some alligators can reach nearly 10 miles per hour in the high walk during short bursts. 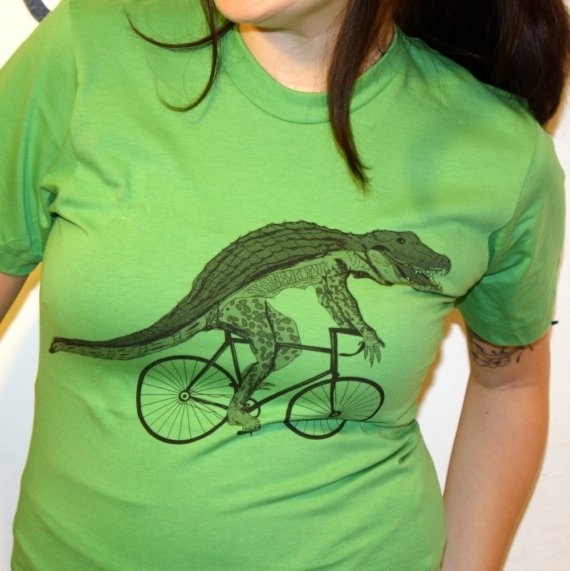 Alligator on bicycle by American Apparel. Click for website. Alligators are common in cartoons, both still and animated. Here I feature a music video with the theme song of a musical group based in Finland, Arnie Alligator and the Jungle Drum. Among the many alligator characters invented through the years is Wally Gator, a character by Hanna-Barbera that I remember from my childhood. All the Wally Gator cartoons can be seen on Kiss Cartoon. 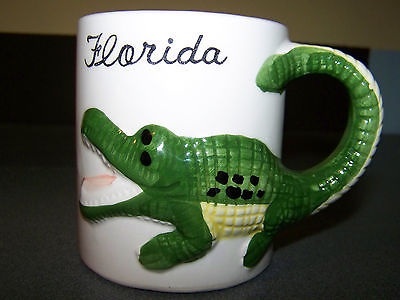 In addition to cartoons, we find lots of alligators on T-shirts, coffee mugs and other items, especially among students at the University of Florida, where the mascot is the Gator. Q: Why don’t alligators like fast food? A: Because they can’t catch it! Q: What do you get if you cross an alligator with a flower? A: I don’t know, but I’m not going to smell it! Q: What do you call an alligator in a vest? Q: What do you call an alligator that sneaks up and bites you from behind? Q: Why shouldn’t you taunt an alligator? A: Because it might come back to bite you in the end. Q: Is it true an alligator won’t attack you if you are carrying a flashlight? A: It depends on how fast you are carrying it. Q: How do you tell the difference between a crocodile and an alligator? A: You will see one later and one in a while. Most of these jokes are from the website Jokes 4 Us, which probably picked them up from somewhere else. Alligators continue to grow throughout their lifetime. Male American alligators average 8 to 10 feet long, females slightly smaller. Very old males can get up to 15 feet long. Alligators are apex predators, eating fish, amphibians, reptiles, birds, and mammals. But they have also been found to have a vegetarian side. The can eat fruit directly from trees, including wild grapes, elderberries and citrus fruits. The temperature at which an alligator’s eggs develop will determine whether the offspring are male or female. Temperatures above 93 degrees will result in males. Temperatures below 86 degrees will result in females. Temperatures in-between produce both sexes. Alligators make a variety of sounds, although they have no vocal cords. By blowing out air, they produce calls for claiming territory, signaling distress, threatening competitors and finding mates. Besides such bellowing, they can growl, hiss and make a cough-like sound called a chumpf.